﻿Click here to see some of the many benefits of joining a choir. Click here for a membership form. Financial assistance may be available for those wishing to join the choir but are unable to pay the $150 annual fee. Please contact us for details. Click here to help determine what part you might sing in our choir. If you don't have choral singing experience, or if you're out of practice, it may take time to expand your vocal range, but don't worry. 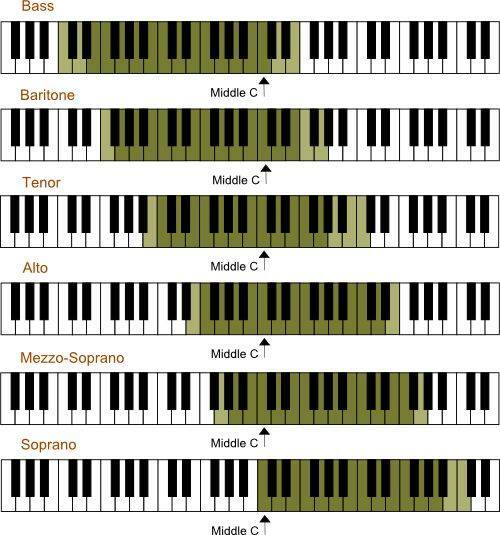 With practice, you'll be amazed at how easily you'll be able to reach those low (or high) notes. This is our 10th Anniversary year! Here's what we have planned. The first three rehearsals carry no obligation to join the choir, so come give it a try! Should you decide to commit to the season, your $150 fee* is due October 2. Rehearsals are held at Good Shepherd School every Tuesday unless otherwise noted. Doors open at 7:00 p.m., rehearsal begins at 7:15 and goes until 9:15 or thereabouts. *Partial waivers may be available for those experiencing financial hardship. Fees cover the cost of purchasing scores, honorariums for our director and accompanist, rental of rehearsal space, festival entry fees and general operating expenses. May 11 - Rehearsal at St. James Anglican Church with choir alumni, 2 p.m.
Singing in a choir is a commitment to the director and to the other members of the choir. Your voice is just as important as the next person’s voice and everyone has to get used to hearing everyone else. That’s how good choirs are made. On the other hand, if you are sick, stay home! Be on time! Arriving late is distracting to the director and other choir members and causes you to miss the warm-up, which is arguably the most important part of rehearsal. Always bring a pencil with you to rehearsal to mark directions on your scores. It’s impossible to remember from week to week the special directions for each tune. Please use pencils, not pens or highlighters as you need to erase all markings before returning your scores at the end of the season. Digital recording devices are highly recommended. They can help you to practice between rehearsals and make our rehearsal time more productive. Opportunities will be made for your to record your parts. Choir singing is a sociable pastime and choirs are full of sociable people! The camaraderie in a choir is one of the most important aspects. Feel free to make merry to your heart’s content before and after rehearsal and during breaks. It’s really easy to start up little conversations with your neighbour during rehearsal. When this happens, the director has to either talk over you or wait until you’re quiet. Chatter slows down rehearsal. Whether you are an experienced choir member or are doing this for the first time, it is very important to be positive. We are all at different levels of expertise and it can be a challenge to make it a rewarding experience for all members. The number one rule is to have fun, then work hard, and then to always enjoy your accomplishments. Enjoy the music. It is chosen based on the needs and abilities of the group. We try to vary the music selections enough so that there is music we can all enjoy.